An old friend, sitting high on some comforting moral ground, once said to me that tattoos are now so ten a penny that it is more of an original act to not get inked than to tread that historically well-worn path of pleasure and pain. Although this is probably statistically incorrect, the point addressed an interesting truth in that we are part of the first generation where the concept of body as canvas is more or less mainstream. I found out years later that the same friend had eventually scrambled down from his ivory tower and happily succumbed to the temptation. The truth is, it is both compellingly tempting and delectably addictive. I in fact spent last Friday morning having an old and ill-advised tattoo covered with a rather spectacular abstract design by Flaming Art Tattoo in my nearby Crayford. Technically this is my 3rd tattoo, although I am left now with only 2, my initial choice a Celtic triangle design on my right shoulderblade dating from 3 days after my 18th birthday (11 distant years ago); it’s attraction was part rebellious indignation at parental disapproval, but mostly just an instinctive connection with the idea that skin can be as much a canvas as vellum, wood, paper, board etc. I had already started to develop, at this young age, feelings which would continue and expand; passionate beliefs I still hold today and which run throughout everything I say and do. Listening to a radio programme yesterday I was reminded of this as I realised that the question which blighted my whole university experience is still grinding on and is likely to do so for as far as I can foresee. ‘What is Art?’ To me the definition is clear, it is indefinable. In the same way people will continue to ask ‘What is Love?’, which I suppose is an attempt to search for guidance, to know which decisions to make, which artworks to buy, which ones to like. But, despite claims to the contrary, to know the history of art does not mean you are able, or qualified, to designate between good Art and bad Art; of this, as a graduate of the subject, I feel certain. Many people disagree, Grayson Perry spoke in Start the Week recently of what he considers to fit these categories (although he did detail in his first Reith lecture yesterday an interesting view that the quality of artworks is judged via a natural distillatory process whilst they move through the art world) but I have always been strongly of the opinion that Art itself is both everywhere and everything. To classify Art only as within the man-made sphere is to me a shocking oversight of the absolute beauty of nature. We FEEL it. Not only nature in the traditional sense; flowers, plants, living creatures, geology, but also in circumstance, coincidence, the way things look and are seen. Every day, even in the seemingly most dull situations or moments; light shining through trees, reflections on windows, line formations in buildings, landscapes, the way a gum mark and a puddle on paving can create an interesting composition. But conflicting definitions of art continue and tattooing in particular, like graffit art, has always been considered a ‘low art’ amongst the contemptible Brian Sewells of this world, if they would deign to consider it Art at all. Rejected by the high-brow crowd as being the domain of prisoners and sailors, it was always written off as being for a class of people deemed unqualified to know what art is. As technology speeds ahead and tattoos become increasingly beautiful and complex, I hope these people are beginning to eat their words. Towards the end of a debauched hen weekend in Ibiza in 2010 (need I really say more?) 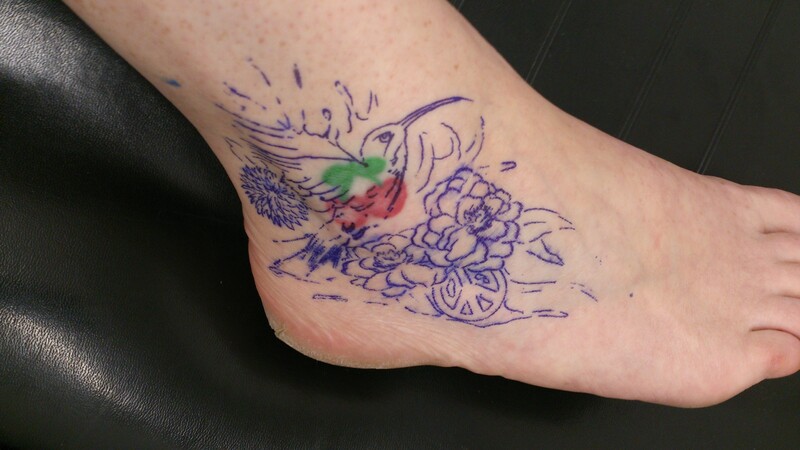 a friend, the hen, stated boldly that she was planning to get a tattoo on her foot proclaiming ‘I *heart* Ibiza’. 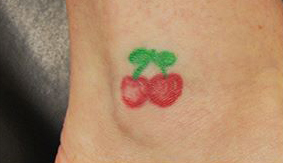 Having already planned to acquire another design myself at some point in the near future, I went foolishly with the spirit of the moment and decided to immortalise the signature experience of the holiday (a distinctly raucous evening at Pacha nightclub) through imprinting the club logo, a pair of cherries, on my ankle. Not only was this a terrible, terrible decision on all fronts, but add to it that 1. Said friend sensibly bottled out at the last minute, leaving me to venture forward on pride alone and 2. The inevitable language barrier culminated in me being utterly certain that the tattooist sternly instructed me to keep it entirely dry. He didn’t, of course, a fact which became all too clear in a moment of horror two weeks later when the huge scab which my tattoo had become, suddenly made a swift exit. Rather ironically, I was away on another hen do, this time in Brighton. As we all leaned in to see what was left, my strangled cries of ‘MY TATTOO FELL OFF!’ rang echoing through the corridors of the premier inn, followed swiftly by bursts of cackling and roaring laughter from my companions. 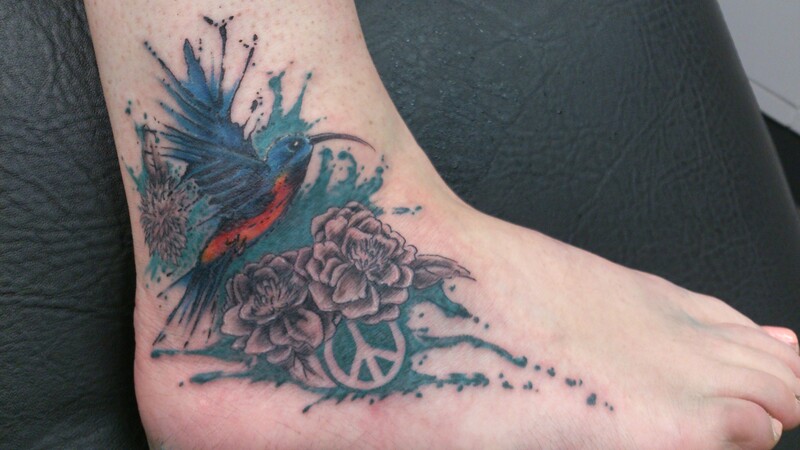 The result of this debacle has been quite at home on my ankle for the past 3 years, but thankfully, no more. After a mere 20 mins of discussion with my esteemed tattoo artist Martin and another 10 mins of his instinctive freehand drawing, I was shown an outline sketch of his proposal. Very nice, I thought, but seeing it without colour or shading makes it pretty difficult to judge the final result. You are entirely dependent on the vision of your artist, the imagery which is forming in their mind’s eye; it’s a highly pressured and skilled role which they step into bravely. They don’t get to spend weeks doing studies or have the option to start again if they don’t like how it seems to be going. One chance to get it spot on; now that’s skill. 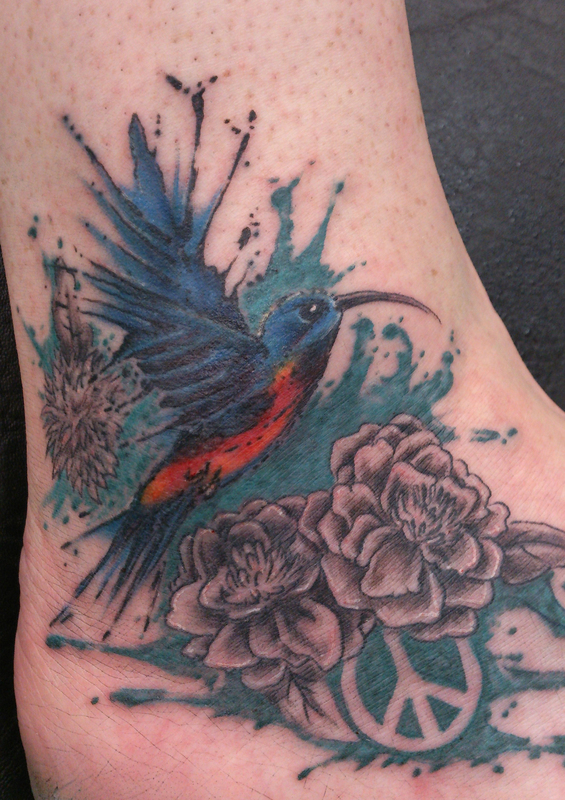 The final result (after 3hrs of just about bearable pain) was exactly what I wanted; an abstract composition combining my favourite colours, the hummingbird (national symbol of Trinidad, the home of my father’s family line), monochrome vintage flowers and the symbol of peace, an achievable yet still mostly uncharted territory in which I believe passionately. Although there are many morals to this story, the most obvious being do not get nightclub logos permanently printed onto your body, the most important, I think, is to respect the art of tattoo, it’s beauty, skill and intricacy; it’s veterans of craft producing unique works of art, to whom I will be forever grateful and utterly in awe of. 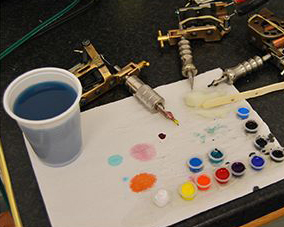 My tattoo was envisaged, designed and produced by Martin Ellis at Flaming Art Tattoo in Crayford.